Drowned Terrapins These 4 diamondback terrapins drowned after being trapped in a derelict crab pot. Photo by Diane Tulipani. Crab Pot The type of crab pot that can trap diamondback terrapins. The gap at the top of this pot was opened by VIMS researchers during their attempts to remove the pot from the water and release the turtles trapped inside. Photo by Diane Tulipani. Diamondback terrapin (Malaclemys terrapin) photographed on the seaside of a barrier island on the Eastern Shore of Virginia. Photo by Kevin R. Du Bois. Researchers at the Virginia Institute of Marine Science are asking recreational crabbers to take a small step that could have a big payback for Chesapeake Bay's beleaguered population of diamondback terrapins. Diane Tulipani, a graduate student in the School of Marine Science at VIMS, is studying the terrapin's role in the Chesapeake Bay ecosystem for her dissertation research. She says "Terrapins are attracted by the same bait used to lure blue crabs to crab pots. Once the turtles get inside, most can't escape, and because they're air-breathing animals, they eventually drown." The problem is most pressing among the pots set by recreational crabbers, which typically sit in shallow waters along creeks, seagrass beds, and marshes. "This is prime territory for males and juvenile female terrapins," says Tulipani. 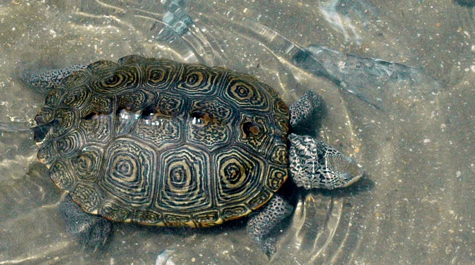 "Because of their smaller size, these terrapins are particularly vulnerable to capture and drowning." Adult males are only half as large as adult females, growing to about 6 inches long. Adult females are typically too large to enter a pot's funnel-like openings. The solution to the problem, says Tulipani, is both easy and cheap—crabbers can simply buy or build small "bycatch reduction devices" and attach one to each of the funnel openings on their pots. A pre-made plastic "BRD" costs about 45 cents. Making one from galvanized wire takes just a few minutes. Recent studies by William and Mary Biology graduate student Megan Rook and Austin Allen, a W&M undergraduate enrolled in the REU program at VIMS, showed that these simple devices are highly effective at keeping terrapins from entering pots, while still allowing the pots to harvest their intended blue crab prey. Rook and Allen were advised by Professors Randy Chambers (Biology) and Rom Lipcius (VIMS). Professor Lipcius has made a recommendation to the Virginia Marine Resources Commission's Crab Management Advisory Committee that recreational crabbers be required to use bycatch reduction devices due to their low cost and ability to exclude terrapins, while not affecting the crab harvest. However, in response to concerns from commercial crabbers, the VMRC Blue Crab Committee earlier this year decided to first implement a voluntary BRD program. "We wanted to know if a voluntary program would be followed," says Lipcius, "and if it would be sufficient to significantly reduce bycatch of terrapins in crab pots." Lipcius and other members of the Blue Crab Studies Program at VIMS plan to monitor participation in the volunteer program beginning later this summer. VIMS will jumpstart its efforts to encourage BRD use among recreational crabbers with a booth at the Institute's annual Marine Science Day open house on May 22nd. The display will feature information about terrapins, a BRD-equipped crab pot, and the opportunity for visitors to make their own set of BRDs for free. A limited number of pre-made plastic BRDs will also be given out at no cost. Instructions on how to make and apply bycatch reduction devices for your own crab pots, as well as information on the natural history of diamondback terrapins, are also available on the VIMS website at <www.vims.edu/terrapin>.